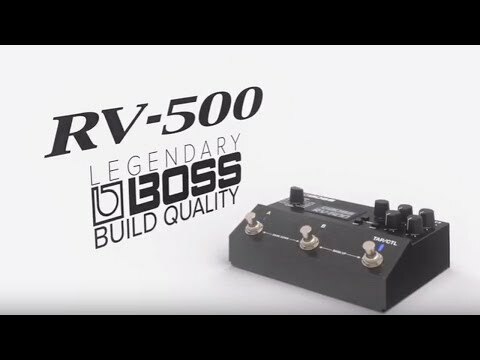 Product Overview Journey to new dimensions of time and space with the RV-500, the most powerful and versatile reverb processor BOSS has ever produced. This multifaceted creation machine features class-defying 32-bit AD/DA along with 32-bit/96 kHz floating point processing and immense programmability, putting pro-level studio reverb and more at your feet. • Room—Four types: small, medium, large, and ambience. • Hall—Three different hall sizes. • Spring—Choose from one to three springs. • Shimmer—Two voices of pitch-shifted reverb. • Fast Decay—Unique reverb with quick decay for increased clarity. • Early Reflection—Four types with envelope parameters to shape unique sounds. • Non-Linear—Includes gate, reverse, and granular types. • SFX—Three characterful reverb types for special effects: Lo-Fi, Slowverb, and Storm. • Dual—Two independent reverbs that can accept a full-range or frequency-divided input. 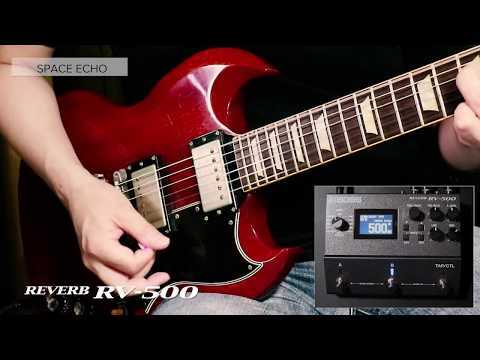 • SRV—Recreates the Roland SRV-2000, a classic rack reverb from the 1980s.